I can’t do everything every day. This is one of the lessons I am learning now that I’m (sorta) a grown-up. I have a tendency to TRY to do everything every day. Yoga, soccer, phone calls – books, writing – friends, family – biking – cooking – baking. YOU CAN’T DO EVERYTHING EVERY DAY. That said, I am realizing the benefits of daily writing. Today, I was running/walking on the trail – two minutes running followed by a minute of walking – and I started thinking about the SNAPSHOT post I’d write when I returned home. I realize that most of my recent posts have been snapshots. And there’s a good reason for that: with the addition of my sweet and cuddly teddy bear, it’s been diffic ult to find pockets of time for writing. Which means I am forced to produce snapshots of what’s been happening in my life in balance, rather than widening the lens to take a broader picture – a panoramic view, perhaps – something more expansive – something that looks at themes and motifs rather than simply what is. It seems impossible, given my current situation, to write every single day. But I’d like to make more time for it – more time for self-examination, for introspection. More time to reflect and to help my mind to settle. Writing helps me to settle my mind. On days like today, when I feel a little scattered, it helps me to center. It helps me to answer questions, like Why was today so unproductive? or What can I do to make tomorrow better? It helps me. And it makes me happy. And I always want to make time for the things that make me happy. The third presidential debate is over, and I think Hillz did a wonderful job. I will admit – I’ve been terrified prior to each presidential debate, quaking in my shoes at the thought of Hillary having to stand on stage with her opponent. But, I underestimated her. Which maybe makes me part of the sexism problem in this campaign. Because, really – what reason did I have to doubt her? It probably goes without saying that I am a Hillary supporter. And her candidacy is running alongside my discovering myself as a baby feminist. A while ago, I was trying to navigate a work situation, and I called my standby profession career consultant, who I keep on retainer – my big sister. My sister gave me a pep talk, the gist of which was: Beware the patriarchy. I hate asking for money. I hate talking about money. I hate negotiating. I hate trying to advocate for a fair salary. I couldn’t even negotiate when I was buying things on the streets of New York, when you are SUPPOSED to negotiate; I found it way too awkward. Some of that comes from my personality. But some of it, I believe, comes from me being a woman – not wanting to offend, not wanting to upset, not wanting to ask for too much. Maybe it hasn’t felt this way for every woman – but it certainly has for me. My sister’s advice worked out well, job-wise. Her words also came at a time when a lot of different forces in my life seemed to be aligning to help me to get in touch with my inner feminist. FORCE # 1 – one of my new favorite podcasts, Call Your Girlfriend, is all about lady power. FORCE # 2 – reading the Notorious RBG book. I love RBG. I worship at the altar of RBG. FORCE # 3 – reading We Should All Be Feminists by Chimamanda Ngozi Adichie. 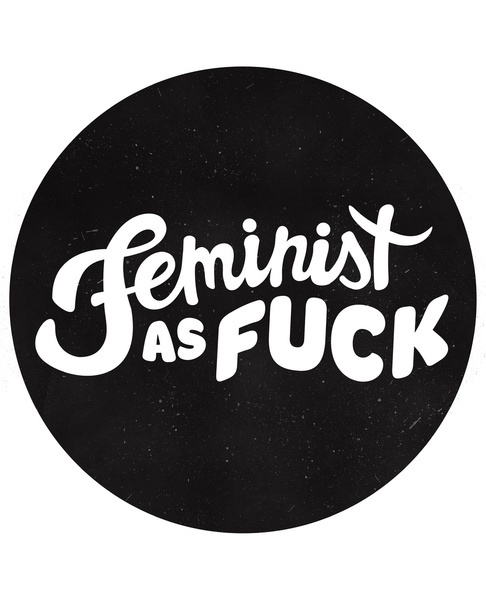 It’s a short essay that originated in Adichie’s 2012 TED Talk and it makes me wonder why I haven’t been wearing a T-shirt that says Feminist As F*ck every day of my life. FORCE # 4 – following the 2016 presidential campaign. I haven’t always been a Hillary Clinton supporter – I voted for Obama – BUT #I’mWithHer this time around! And it’s not just about who she’s up against. I think she’s smart and qualified. I trust her more than a lot of her opponents seem to. AND I am uber-annoyed by the sexism she faces. I don’t know if I realized how much sexism still existed in modern society until Hillary began her run for president. I find myself giving pep talks to friends, pointing out inconsistencies in the workplace and the community, and noticing when women are treated differently than men. This is not making me miserable and pessimistic – it’s helping me to feel awake and powerful. And – you know. Wild Peace Farm is moving! Tee and I found a farm to rent in northern Baltimore County, and we are so excited. I love moving. It’s a chance for a fresh new start – to set up new systems, to put things in their place. It’s a time to discard things, and I always get a big charge out of decluttering and making a big donation box to drop off at Goodwill. Additionally, I just finished reading a life-changing book – The Life-Changing Magic Of Tidying Up, by Marie Kondo. I am obsessed at the moment. It’s helping me to look at my everyday life and my stuff with a whole new light. Also, Kondo promises that even the messiest, most disorganized person can do a big bout of tidying and then be able to maintain it forever effortlessly. (Whaaaaaaaat?) Reading this book when we’re about to move is pretty perfect timing; it’s making me even more excited to settle into our new home and to find a place for everything and to put all in its place. Last summer, Tee and I gave our nephew a book of Shel Silverstein poetry for his birthday. Eventually, our nephew learned to love the Silverstein book. We were going through his bedtime routine a few months ago; since he’s seven now, he usually reads to us before bedtime, rather than the other way around. He read several poems out loud to us, giggling uncontrollably the entire time in that adorable way seven-year-old boys giggle. It was so sweet to see him laughing at poems like Cloony The Clown (a poem I once recited in front of my sixth grade English class) and Sara Cynthia Sylvia Stout. Currently I have two favorite Shel Silverstein poems, and they do more than just make me giggle. The first is Hug O’ War, pictured above, which is cheesy and adorable and a pretty dead-on tribute to the way I wish the world worked. The other poem is The Voice, which is taped to my desk at work. It’s a poem that doesn’t really have the Shel Silverstein silliness – it’s just simple and sweet and true. There’s a voice inside all of us that guides us, if we’re quiet and still enough to listen. Paolo Coelho says, “When you want something, all the universe conspires to help you achieve it.” I think he’s indirectly talking about Flow when he says that. When you’re in the moment, and doing the next right thing, and moving gracefully and intentionally, then it just seems like life is guiding you along. Like you’re in a river and following the current. I love this feeling – I love when I can feel Flow working for me in my life. And this feeling has been coming back to me over the course of these past few weeks. One of the biggest challenges of the adoption wait has been feeling stuck – feeling frozen in time and place. With every decision and plan that’s been presented to Tee and me, I’ve felt like I’ve needed to postpone, to delay, to not make any major moves until the baby comes home. Wait until the baby comes home to apply for new jobs. Wait until the baby comes home to look for a new place to live. Even the littlest things, like waiting for the baby to come home to set up a visit with a particular friend or to start saving up for the honeymoon we haven’t taken yet. That feeling that I’m stuck, that I can’t make any moves in any direction – I think it’s made the adoption wait a lot harder than it’s needed to be. It’s important for my soul that I am always growing, changing, and reaching. In order to feel like you’re in the Flow, you have to feel like you’re moving. You can’t get anywhere when you are frozen. I’m not talking about stillness – calm, peaceful stillness… That sounds lovely, cultivating stillness and peace in your life. Being frozen is something different. Ever since I took myself off hold, pressing my internal defrost button, I’ve felt so much better. Things have been falling into place. There are difficult things happening, but I am moving myself forward, taking the next rig ht step each time, and I have confidence that the flow is guiding me along. It makes it easier to wait for Our Baby when I feel like I am living my life. And ever since I started to take myself off hold, to unfreeze myself – things have been falling into place in this magical, wonderful way. That’s what happens, when you let go and go with the flow. It’s magic. Crazy beautiful wonderful magic. When things start falling into place, it helps me to get some of my faith back. It’s still a challenge – because there’s so much uncertainty right now. But going with the flow is helping me to fill my heart with joy and peace, and to melt my worries away. Sometimes we are held hostage by our own expectations. At least, I am. I expect things to work out a certain way and then, when they don’t, I am crushed. Crushed. It doesn’t feel good to be crushed. Sidebar: Was every wise statement written by Anne Lamott? Possibly. It’s true that I am happiest and freest when I live my life without attachment to any specific outcome. But it’s so hard to live like that with any consistency. A bird, flying free of its cage. Survival Strategy # 3: Let go. Let go of all your expectations about when things will happen and how things will happen. You can’t control how your life turns out. You can let go; you can relinquish control, and you can set yourself free. Hope # 3: Looking forward to bedtime reading with Our Bab y. We decided to get the book for Our Baby. So, Stinky Face, come home soon! I was given my first SARK book at Boston University. I was working in the Student Activities Office during my senior year, and one of my faculty advisers gave the book Succulent Wild Women as a graduation gift. I loved it. SARK’s books are about creativity, friendship, prosperity, and inspiration. And they’re colorful and beautiful and quirky. The author’s actual name is Susan Ariel Rainbow Kennedy; SARK is her pen name. Her books are incredibly beautiful. (See below for an image of the inside of one of her playful, lovely books!) I started giving SARK books as gifts compulsively. Recently I’ve discovered SARK’s Facebook page, and it’s been wonderful #soul food. She posts beautiful images and quotes, some hers and some from others. I’ve been reposting them, sharing them constantly. I really like this SARK quote: Invent your world. Surround yourself with people, color, sounds, and work that nourish you. The thing s that nourish me – that’s what I need around. Healthy food – love – fresh air – nature – colors. I am very intentional about my space. I like my space to be warm and inviting and comforting and comfortable. And I like the people around me to be those things, too. More and more, I’ve been using social media as a vehicle for inspiration and creativity. I’ve only been ‘following’ the pages and the people who fill my life with positivity and beauty. There’s a lot to worry about and to fret about in life – there always has been , and there always will be. If I choose to surround myself with peace and joy, though, my worries melt away and my heart is filled with serenity.